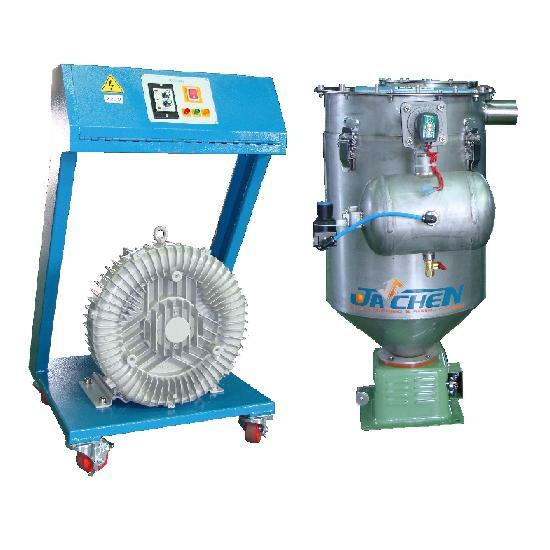 Auto Loading Machines / Vacuum Autoloader(JVP Series) - Sinchung(Jachen) Technology Co., Ltd.
JVP series Auto Loading Machines - Powder Sucking Machines be used to load PVC powder, calcium-carbonate powder, calcium-carbonate powder, monosodium, powder, and any dry powder to barrel. Then it will go into extuder or inject mould machines. Super-strong sucking function has high efficiency. Integrated large stainless steel material can storage tank. Extra large dust-collect tank, doubled storage contents cleanable outdoors separately to avoid polluting machines and work place. It can clean net reversible. Material shortage warning device equipped. Unique pulse cleaner design and effectively eliminating powder residue. Special non-woven fabric can block the powder from leading accurately. Suitable for PVC powder, calcium-carbonate powder, calcium-carbonate powder, monosodium, powder, and any dry powder conveyance. Work well with pulsed bag filter, automated calculator, Lu style blowing machine, central feeding system.